Nikki Randhawa Haley, former U.S. ambassador to the United Nations, has been nominated to be a member of Boeing‘s (NYSE: BA) board of directors. She is set for election at the aerospace and defense contractor’s annual shareholder meeting on April 29, Boeing said Tuesday. 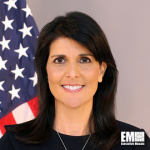 Haley left her U.S. envoy position in December 2018. Prior to that, she was the first female governor of South Carolina and served in the post between 2011 and 2017. “Ambassador Haley brings to Boeing an outstanding record of achievement in government, industry partnership and successfully driving economic prosperity for communities in America and around the world,” said Dennis Muilenburg, Boeing chairman, president and CEO. The Chicago-based company expects her to bring diplomatic, government and business experience to help advance its efforts across the aerospace and global industry.